We are a small rescue run in south west Sydney. We TNR, feed maintained colonies and rescue sick and injured cats off the streets. In order for you to successfully adopt from The Feline Committee, you will need to fill in a questionnaire outlining important information such as, contact information, rental approval to own pets, whether you have experience with animals, whether you wish to have an outdoor or indoor cat etc. once you have filled in this questionnaire, if the details match our expectations and the needs of the cat we will contact you to process the application. 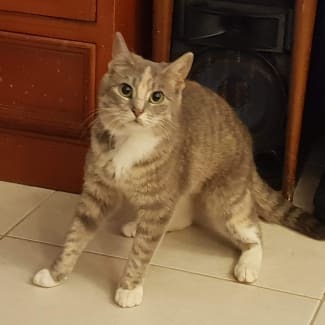 We will then organise a home visit and inspection and a meet and greet, if both the cat and the family get along and the family wants to proceed with the adoption, we will then allow the cat a 2 weeks trial with the family. If they are still wanting to adopt we will process the adoption and get necessary adoption forms signed and microchip transferred. Lucy is a beautiful cat with CH however due to her disability she doesn’t like being touched too much or handled. Lucy doesn’t mind a pat while she is relaxing or during meal time but she doesn’t like being excessively touched and hates being picked up. Lucy is very friendly but it is due to her disability that she doesn’t like too much affection. 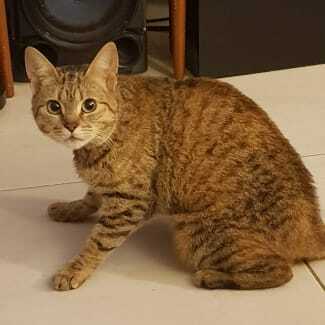 She is bonded with her sister Lilly who is extremely affectionate so you won’t miss out on cuddles if you adopt the pair. Lilly is a sweet natures kitty who loves to purr. She has Cerebellar Hypoplasia so she wobbles. This disability doesn’t stop her from being an awesome cat but rather makes her extra special. Lilly is bonded with her sister Lucy who also has CH so she would love to go to a home where both of them are welcome.